"Arnot-Roberts Wines is a joint project of schoolhood friends, Duncan Arnot Meyers and Nathan Lee Roberts. Since founding their winery in 2001, the duo has been one of the most progressive and revolutionary producers on the California landscape. Together with a small group of fellow trailblazers, they have led the way to help re-define the paradigm of what California wine can be and taste like. Like all great winemakers, the cornerstone of their approach starts with a dedication to finding uber-distinctive and often extreme and unique vineyard sites spanning from Mendocino County to the north and to the far reaches of the Santa Cruz Mountains to the south. Interestingly, before Arnot-Roberts, the majority of these vineyards had been previously completely unknown or totally unheralded (e.g. Clary Ranch for Syrah, Fellom Ranch for Cabernet, Luschinger for Trousseau, and Trout Gulch for Chardonnay, among many others). It has only been due to their uncanny sleuthing ability - seeing what might be "possible' - that the duo has been able to understand and unlock the potential of these amazing vineyard sites. Of course, when the opportunity has arisen to tap some of California's historic vineyards, Duncan and Nathan have seized the opportunity! Some of these include Coastlands and Que Syrah in the Sonoma Coast, Peter Martin Ray in the Santa Cruz Mountains, and Montecillo atop Sonoma Mountain. Although they don't own any of these parcels, another big key to their success is in partnering with vineyard owners and viticultural consultants who are willing to take the care, attention and risks to 'harvest' the true potential of grapes. 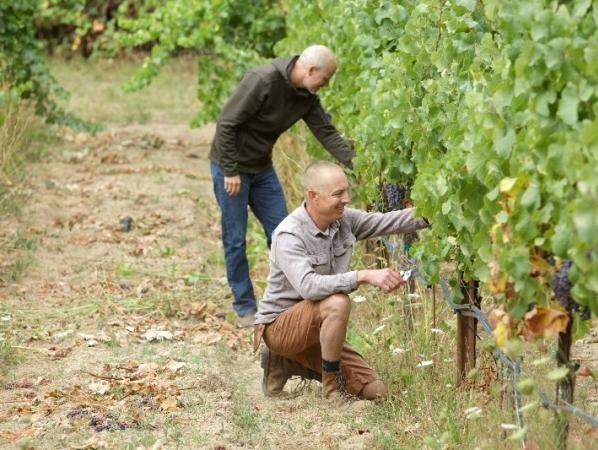 The duo work closely with their vineyard partners to not only up the ante on the farming, but also to encourage them to farm organically with as little impact on the environment as possible. At harvest time, extreme diligence is paid to "nailing the pick" at that elusive moment when sugars, acids and flavors all come into harmonic convergence. Because most of these parcels are in cool to very cool viticultural areas, that means lower sugars/alcohols and higher acids in the resulting wines without sacrificing flavor intensity and complexity. This regimen they feel also allows all these wonderful and diverse sites to express themselves with clarity and focus. Winemaking at Arnot-Roberts borrows from both the old world and new, and 'Old School' and new as well. While each wine gets its own regime, the general technique includes indegenous fermentations, little or no new wood, and whole-cluster inclusion for the red wines. Chardonnay is fermented in stainless steel and then aged in neutral wood - with a nod to the masters, Dauvissat and Raveneau. Syrah is fermented 100% whole cluster with submerged cap and pumping over - a la Gentaz and Juge. And Cabernet Sauvignon, in a unique twist, is also fermented with partial whole cluster ("to tame the fruitiness"), and then aged in barrels coopered by Roberts himself! His father, in fact, was a cooper and taught him the craft. Visiting Duncan and Nathan at harvest time, it is not the usual nail-biting, stressful experience that one often sees. Instead, you are able to witness a remarkable "Zen", with music playing and grapes arriving to be processed and fermented in an orderly, methodical, yet low-tech manner. The movements are sure-handed and intuitive, like dancers trained in the ballet of "small, hands-crafted winemaking". At lunch, the work stops, and a proper revitalizing meal is served. Corks are popped, and the inspiration continues to unfold...an old-school Napa Cab and a micro cuvee of grower Champagne. Or perhaps a Jura wine and/or a crusty old Rhone? The bottles are being savored, yet at the same time the wisdom contained within is being downloaded to be interpreted or intrgrated into a new idea or refinement somewhere down the road. In the old days of California wine, it seemed that you either wanted to outdo the Old World competition by flexing your power and might, or else try and mimick the Old World by copycating the classic standard bearers. In today's wine world, producers like Arnot-Roberts use the Old World only as a muse. There is great wisdom in the tried-and-true archetypes, but the heart and soul of California Wine has its footprints clearly on home turf. Arnot-Roberts Wines have shown that California Wine not only can shine at the table but can also express the individuality of the sites they come from. It can age and develop in complexity from post-bottle youthfulness to the glories of a fully mature and harmonious bottle (and everything in-between). These are today's measuring sticks for great and interesting wine, whether from California, or France, Italy, Tasmania, or anywhere that strives to produce quality wine. It is a pleasure to see that two super humble guys from Napa, California have done right by their roots, and helped to shine a new light on the wines of their home state."